What does it mean to be happy? How do you know that you are doing well? Turns out there is no universal definition for this pleasant emotion. Research shows that different cultures around the world have unique concepts of well-being and happiness. It is probably safe to assume that every human in any society has a desire to be happy. Studies in recent years suggest, however, that we aren’t all completely alike in our happiness and that our interpretation of happiness may very well be dependent on our cultural contexts. Hence happiness isn’t only one standard emotional state, the term happy also carries different semantic and linguistic connotations. Not all languages refer to happiness the same way. Asking “How happy are you?” is a complex task in several languages, and this question couldn’t even be properly posed in the English of Shakespeare or Chaucer’s time, a paper published in the International Journal of Language and Culture found. In Chinese, there are actually several different terms for happiness, each of which have a slightly different meaning. Hsu and her colleagues are carrying out their own happiness survey in China, with the hope of learning how to better measure happiness not just in China, but in other countries, as well. Their survey focuses on three dimensions of happiness — a good mood, a good life and a sense of whether one’s life has meaning. Hsu breaks those meanings down in the diagram below, which shows that the English words “happy” and “happiness” encompass just part of those definitions. On the right, she maps one of the Chinese words for happiness, xingfu. Unlike the English translation of happiness, xingfu refers not to a good mood, but a good life, as well as a life with meaning. In Chinese, each of these three kinds of happiness can actually be translated as a different word, says Hsu — xingfu for a good life, you yiyi for meaning and kuaile for a good mood. By using those three words to ask different questions, researchers may be able to measure dimensions of happiness in Chinese that are often brushed over in English. Aside from the question how cultures define happiness there is also a significant difference in how people around the world express a positive emotion to the outside world. To smile or not to smile. Scientists have known for decades that societies have their own unwritten rules about when it’s appropriate to smile, frown, or get angry. These rules are part of a country’s “emotion culture,” the norms that influence how and when people express whether they’re pleased or upset. Researchers often study these differences geographically, finding that the United States and the West tend to be more expressive than China and the East. In her research, Paula Niedenthal, a psychologist at the University of Wisconsin, Madison, found that the differences in emotional expressiveness and the functions of smiles is directly connected to the role migration played in shaping a culture: Countries with greater immigration over the past 500 years are more likely to interpret smiles as friendly gestures, whereas those with less migration think smiles were related to the social hierarchy. Niedenthal and her colleagues suspected that, over time, countries without many immigrants would agree on rules for how much emotion to show in certain situations. People in those countries might even suppress their true feelings so as not to upset the social pecking order. In Japan, for instance, subordinates use smiles around their bosses to hide feeling upset. For countries with a more diverse past, though, the story would be different. “What we’re talking about is a collision of differences in language and emotion culture,” Niedenthal says. People in these melting pots would need to beef up their facial expressions to overcome the language barrier. These different behaviors and happiness concepts can be the cause for confusion across cultures. Especially when expressive meets unemotional, or individually happy interacts with xingfu. Just look at the research of Kuba Krys, a psychologist at the Polish Academy of Sciences, who found that culture shapes judgments of intelligence and honesty of smiling individuals. Cultures that are low on this scale tend to have social systems—courts, health-care systems, safety nets, and so forth—that are unstable. Therefore, people there view the future as unpredictable and uncontrollable. Smiling is a sign of certainty and confidence, so when people in those countries smile, they might seem odd. Why would you smile when fate is an invisible wolf waiting to shred you? You might, in those “low-UA” countries, even be considered stupid for smiling. Krys also hypothesized that smiling in corrupt countries would be, um, frowned upon. When everyone’s trying to pull one over on each other, you don’t know if someone’s smiling with good intentions, or because they’re trying to trick you. To test this theory, Krys had thousands of people in 44 different countries judge a series of eight smiling and non-smiling faces on a scale of honesty and intelligence. He compared their answers to the country’s rankings of uncertainty avoidance from a 2004 study of 62 societies and ratings of corruption. He found that in countries like Germany, Switzerland, China, and Malaysia, smiling faces were rated as significantly more intelligent than non-smiling people. 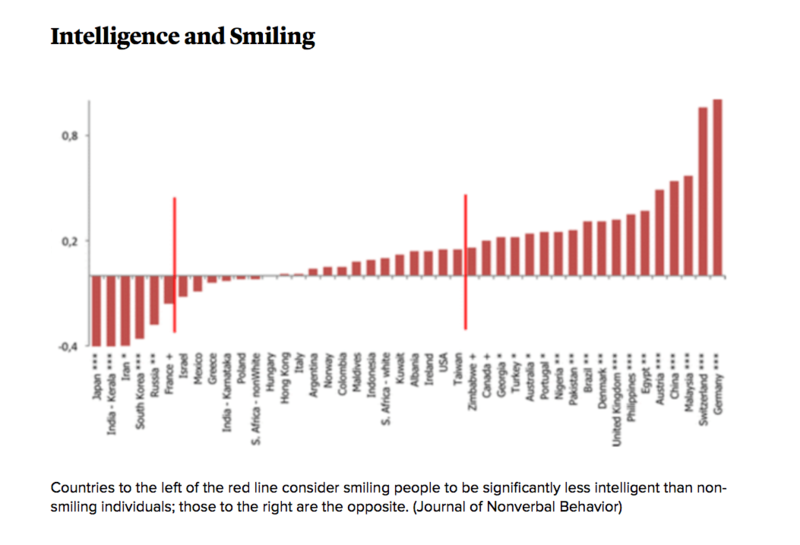 But in Japan, India, Iran, South Korea, and—you guessed it—Russia, the smiling faces were considered significantly less intelligent. Even after controlling for other factors, like the economy, there was a strong correlation between how unpredictable a society was and the likelihood they would consider smiling unintelligent. 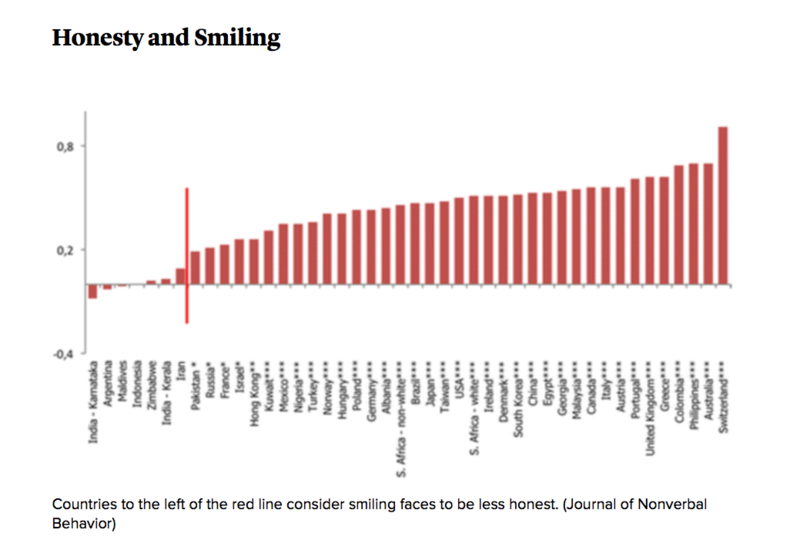 In countries such as India, Argentina, and the Maldives, meanwhile, smiling was associated with dishonesty—something Krys found to be correlated to their corruption rankings. 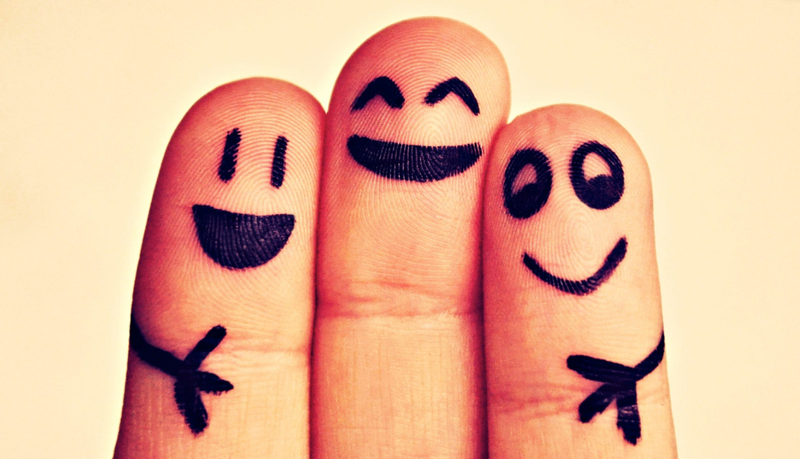 All of this empirical evidence shows that determining whether a person feels happy can be quite difficult. A smile can be as misleading as an unemotional (or grumpy) face. And knowing what constitutes happiness for the people whom we interact with requires that we familiarize ourselves with the value sets and belief systems of their culture.